One of the most common questions asked when starting an online business is whether to buy or build a website. Well, the answer depends on various factors and where you are coming from. In today’s article, we are going to discuss about that so you can have a better idea on which route to choose. Generally, monetizing from websites will interest two groups of people here – small business owners and online marketers. Each has their own approach, hence the website requirements will also vary. The first thing to do is to identify which of these groups you are coming from. And then we’ll see how the process works for each. This form of business applies to those who operate from a physical location, just like all the stores in your town. They are either service providers, product retailers or even non-profit organizations that could benefit from a web presence to improve on their brand awareness within the local community. Simply put, if you Google the name of your business and the result points to a Facebook page or local listings, then you’d certainly need an official website. 1 – Improve Branding – That’s the obvious one. With a website, you can have your own business domain and logo published online and it doesn’t need to share space with other sites. The domain will reflect the exact name of your store and it would forever be your property unless you relinquish it. So if the name like SamsBicycleShop.com has not been taken yet, you should quickly buy the domain before someone else does. In the event that the desired domain is no longer available, see if you can negotiate to switch ownership, otherwise go with a new domain extension such as .net or .org while retaining the business name. 2 – A Simple Website – There’s a general impression that business websites must look fancy, if not, they would fail to attract customers. That’s not entirely true. The crucial point is to be informative, reader-friendly and easy to contact. Most of the time, potential clients are actually looking for a number, a person or an email contact to make inquiries so if you can provide these through a simple looking website, that’s a good start. 3 – Switching From an Old Site – If you are finding a lot of limitations on your current site like slow loading speed and mobile incompatibility, chances are, it’s probably built on DIY platforms that have difficulty catching up with technology. If clients find the design outdated, then it’s high time to build a new website with WordPress. WordPress is better because the software is constantly updated, there are many plugins for customization and a ton of professional looking themes that are business specific. Plus, their hosting services are usually more robust so more up-time can be expected versus down-time. Even though it’s not an intuitive builder, the program is fairly user-friendly for most people. If you like to see what the back-office of a WordPress website look like, simply build one using a free domain below. 4 – Taking Charge of Marketing – From the technical side of things to writing their own content, some business owners like to get their hands wet. If that’s you, then building a site will certainly teach you a lot about internet marketing from a practical perspective. With these skills, you’ll learn how to boost your local SEO and gain more online traffic from the search engines. 5 – Reduce Costing – With today’s technology, you can create and run a website for as little as $5 per month. For better performing WordPress hosting, the cost is probably about $50 per month. This investment is a fraction of what it would cost you with traditional marketing (think newspaper ads, brochures and etc.) which doesn’t really engage with people as much as online marketing. Plus, with a website, your business gets exposure 24/7 so it’s worth the monthly expenses. If you resonate with any of these five factors, then you should take the challenge to build your own business website. And since many local businesses still don’t have a web presence, this valuable knowledge will certainly give you an added advantage over other competitors. In a practical sense, people don’t actually ‘buy’ a local website. Rather, they hire someone to build, develop and manage it for them. Since the process involves a lot of customization, it’s very rare to find a ready-made website that’s perfectly suited for your business. 1 – Specific Online Goals – Perhaps you want more than just an informative site. In the case of bigger establishment, you may want to set up an online store or have a booking system in place to generate more online sales. While there are specific WordPress plugins for these functions, sometimes it’s better to let the professionals handle the technical side of things than doing it yourself. 2 – Specific Customization – Likewise, if there’s a specific color scheme, design, or navigation that you want to appear on the site, engaging with a web designer to customize the layout is a better option than using free themes. Plus, they are likely to get the job done faster than most of us who don’t have designing skills to begin with. 3 – Optimizing for SEO – Maybe you’ve tried to apply SEO on your site and it’s still not ranking on the search engines or slow in generating traffic. If that’s the case, it’s probably a good idea to hire a local SEO expert into the picture to fix the problem. 4 – You Have the Budget – Hiring someone to handle your business website may cost between $3K to $6K for initial setup and a couple hundred to thousands more per month to maintain it. If you have that kind of budget to spend, then outsourcing these tasks will certainly free up some time so that you can work on other aspects of growing your business. With that said, let’s move on to the next group of people. Bloggers, affiliate marketers, website experts – these are individuals who run online businesses without being attached to physical locations. Thus, the main functions of a website here is to communicate, engage and ultimately convert readers into customers. For that to happen, the content needs to convey a certain level of trustworthiness. If it’s weak and suspicious, people will lose interest. If it’s solid and well thought, then people are more likely to take whatever actions that you want them to do. 1 – Learn SEO – Search Engine Optimization is one of the most fundamental strategies in acquiring free online traffic and the best ways to pick up the skill is to create and tweak the site so that it can get indexed faster and rank higher on the first page of Google. 2 – Learn Content Creation – The internet is all about information distribution and if you want to target a specific audience, then building a site will provide immediate opportunity to create the type of content that you want to deliver. In the process, you’ll learn how to research for keywords that are specific to your niche and apply that to your SEO skills. 3 – Shoestring Budget – If you don’t have a pre-existing business, but would like to start a side income in a specific niche, the cost of building a site is quite affordable for many people. For as low as one dollar per day, you can literally own a fully functional WordPress site that can be scaled for traffic using content and SEO knowledge. Just like previously with small business owners, this process can equip you with a lot of web skills that is crucial to know if you truly want to become a full time online marketer. One of the most common reasons to buy is actually to flip websites for profit. It can be applied to blogs as well as eCommerce stores. The process basically involves purchasing a ready-made website (plus content) that belongs to a popular niche, scale the traffic and resell it at a higher value. Before buying, it’s important to screen the background of the site first. What kind of platform does it use? What’s the monthly maintenance like? Does it have good quality traffic sources? How much SEO has been done on the site? Questions like these need to be answered to ensure that you are paying for what’s worth and not dealing with scammers. After buying, you also need to invest in marketing so that the site continue to thrive and generate the kind of desired income. Are you going to write the content yourself or outsource? Are you going to invest in paid ads? If the site comes with an email list, how are you going to follow up with the subscribers? There’s a lot of planning to do so make sure that you are really familiar with the niche before taking over the site. Buying and selling domains or websites is a serious online business that involves the transaction of big sums. Hence, I wouldn’t recommend for amateurs who are inexperienced and more so for individuals who don’t have that kind of capital in the first place. However, if you are still interested in this form of trading, the following webinar should be able to offer more insights on the subject matter. Just like any property, there are many pros and cons to consider when starting a website. No one can tell you if it’s right or wrong. Your decision to buy or build very much depends on two important resources – time and money. If you have the time to learn, then building from zero is a valuable experience. If you have the money, then it’s better to hire or buy so that you can increase productivity and generate more online income stream. I hope this concise explanation has benefited your knowledge and that you are now in a better position to decide on which route to take. For the latest training on website building and marketing, please visit my recommended business platform or leave your comment below and I’ll get back to you. Thanks for this informative write-up. I’ve always thought that the most important factors that should determine buying or building a website should be the availability of money and the reason for the website (type), Now I know better – I have been enlightened. The webinar on buying and selling domains is a must watch for me, as I am actually interested in that line of business. I actually enjoy building my own websites. Building your own websites especially when you are starting out is a great way to learn the steps involved so that in the future, when you decide to outsource the task, you will know what you want and expect from someone else doing the work. I am new to building a website and found this article to be quite interesting. ﻿Would you recommend for a person like me to buy a website first in order to grasp what a good website should be like before creating one? Appreciate your advice. Hi Joe, if you are totally new, I would recommend building one from ground up. This would give you some edge in terms of understanding basic web skills and how that can be translated into a good value website. Without knowing the nuts and bolts, you could end up paying more than what’s necessary. I was thinking if I should buy a website before this, but I think it would be better to build one from scratch as I would gain some experience along the way. Who knows – I could use the knowledge and create websites for other people and make some money. It’s a good freelancing income to consider. Hello Cathy. 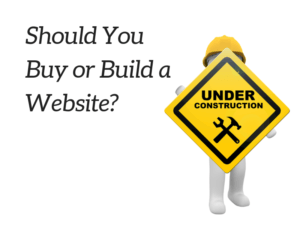 This is actually a comprehensive post on building a website versus buying one. I think the latter option would save a lot of time and stress, but in doing so, one may not have a good knowledge of how things were built in the first place. As for me, I’d prefer to take my time to learn and build my own business website and grow from there. Building a website is no longer a problem if you choose a powerful platform like WordPress. One can get started and launch their sites in less than 15 mins. However, choosing a profitable niche, writing content and getting traffic will be the most difficult for beginners so some people may want to outsource these tasks to other people. Granted, they have the budget for it and know what they are doing. This is a great post! I am very happy to know that I can create my own site without hiring any professional designer. Some companies will ask around $1000 dollars for a basic average size site, which I think it’s too much. The worst part of it is that, they will not show you how they tweak the SEO. So, you will always be in the dark, not knowing the mechanism and thus, will always rely on and pay for external sources to help you. It’s good if you have the money, but not everyone can afford that. I decided to build my own website. I really had no knowledge about web design when I got started, but I have been able to build the site, write several articles and have even learned some simple HTML coding to customize specific things. I have really enjoyed the process as well. There is so much information online that you really don’t have to worry about having the right expertise. You can be a total novice and utilize YouTube for marketing and also learn how to create an awesome website.